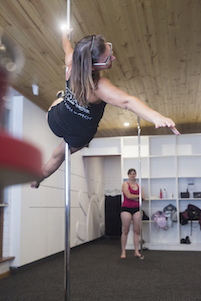 ​As the founder of Foxie Pole Dance & Fitness Studio I’d like to share a little about my own pole dance journey. When I started pole in 2012, I was looking for a way to get fit, but I was also looking for something more than just working out. Over the years, I have tried many forms of fitness, including: gyms, yoga, aerobics and zumba to name a few. But, none have grabbed me, excited me and, driven me as much as pole dance. After only a few weeks of pole I realized that I had found the more that I was looking for. I enjoyed the fitness aspect of poling; it’s an incredible way to improve all round fitness, muscle tone and, cardio. However, I also found that it’s an amazing way to build confidence, not just in one’s own body image, but also through the way you have to stretch your mind and challenge yourself when faced with new moves. I liked too the sensual side of poling, which is very different from the ‘stripper’ image usually associated with the words ‘pole dancing’. ​A medium of dance that has become my passion. ​Coming from a ballet background and a love of dance, for me, ‘pole dancing’ provides a unity of fitness, self confidence and, sensuality, which has given me the strength and confidence to express myself freely through a medium of dance that has become my passion. Pole Dancing is becoming a mainstream and well sought after form of exercise and I am proud to be an ambassador and teacher of this unique and beautiful style of dance. I understand that each of us is perhaps looking for something different when we set out on our pole dance journey and I’ve created Foxie Pole Dance & Fitness Studio to be a place where women feel welcome, have fun, make friends, are empowered and of course improve their fitness.